I grew up keeping Passover as one of the few holidays that my family observed. Every Spring, out came the fancy china, the matzah ball soup, the brisket, the gefilte fish, the charoset, the afikomen, the bar mitzvah yarmulkes, Elijah’s chair, the seder plate and its elements, and, of course, the Haggadah. My grandparents and aunt and uncle from across town would be there, and usually my other grandparents, great aunt, and aunt from Brooklyn would drive in as well. I remember that during these family get-togethers our home was always very loud with activity, which carried over into the seder. My dad would lead the seder, anxious to get to the bo-re p’riy hagafen, and my little sister would read the four questions—an honor coveted by her big brother. Of course, the “telling” was punctuated with my mother silently, but noticeably excusing herself to check on the progress of the food. This would begin a small exodus from the table consisting of my Aunt Mady and Grandma Berger. Since the days of my youth, I have attended many different seders, both in homes and large groups. Some time after I became a believer in Yeshua, I learned of the Messianic Passover Haggadah from Lederer Publications, and Passover finally began to have meaning for me. My heritage as a Jew became reinforced in a way that had not happened during my youth. Needless to say, I greatly appreciated the Messianic Passover Haggadah, and rejoice in the many others that Messianic Jews all over the world continue to develop to this day. As time went on, I began to study the Scriptures and the sources of various Jewish traditions. I eventually realized that while the core of the modern Passover seder is the telling of the story of the Exodus, many of the elements of the traditional seder are simply creative innovations not found in Scripture. I also came to realize that the Pesach was not the seder itself, but the actual animal that was to be sacrificed and eaten at the end of the fourteenth day of the first month. Through this process, I began to view the modern Jewish seder as it was originally intended—as a memorial. Like many Jewish traditions, the seder was created as a substitute to make up for the nation’s current status in dispersion. Our modern minds have made it the Pesach, but I believe this misses the mark. So, feeling somewhat at a loss with the traditional Passover Haggadah—the service after which every known Messianic Haggadah is patterned—I finally decided to try my hand at compiling one of my own. I began my adventure intent on answering only a single question: what would happen if I let Scripture speak for itself… could Scripture adequately tell the Passover story without a man trying to put it into his own words? Well, the result of that experiment was Perfect Word’s Behold the Lamb—a modern, Messianic Haggadah, of which approximately 90% of the words on the page are nothing but direct quotes from Scripture. Also unique to Behold the Lamb is that it does not draw upon centuries of time-honored Jewish tradition, further distinguishing it even from other Messianic Haggadahs. In arranging the Haggadah, there was little attempt to make the service more lively, more entertaining, more meaningful, more Jewish, more Messianic, or anything else. And yet, my family and I personally find this Haggadah to be highly satisfying, because we know that we are remembering Passover with Scripture—the eternal source of all perfect truth—as our storyteller. Can there be a meaningful remembrance of the Passover without seder plates and afikomen? Is the Word of God sufficient to bring the Passover to life in our hearts and minds? You tell me. 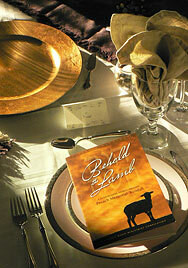 Learn more about the Behold the Lamb Messianic Passover Haggadah! https://www.perfectword.org/wp-content/uploads/2017/04/logo-full-size.png 0 0 Kevin Geoffrey https://www.perfectword.org/wp-content/uploads/2017/04/logo-full-size.png Kevin Geoffrey2011-03-24 05:33:562017-07-06 11:23:49Behold the Lamb! For Let This Attitude Be In You… The Scriptures are God’s "Perfect Word"